Posted on Fri, Jan 13, 2012 : 2:16 p.m. Though it probably feels like Meryl Streep has been winning Oscars every few years, the truth is she last took home the gold statue when Ronald Reagan was in office (it was for "Sophie's Choice"). Streep sure gets nominated a lot (16 times so far), but her talents and dizzying array of accents are accepted as such a given that her performances are frequently overshadowed by actresses-of-the-minute, stars who sparkle for a few films then quickly fade away (I'm looking at you, Helen Hunt, Hilary Swank and Halle Berry). Like her turn as Julia Child in "Julie and Julia," Streep once again dramatically outclasses the film she's in. Unfortunately, while the quality of her performances may stay high, her choice of projects gets worse and worse. From director Phyllida Lloyd ("Mamma Mia! 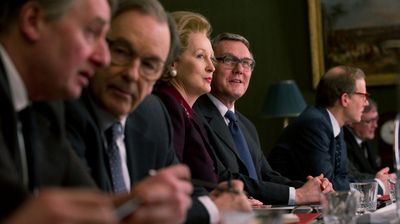 "), "The Iron Lady" is as dull, clichÃ©d and wrongheaded as a biopic can be, sporting a shallow and hamfisted script, and equally inept direction. But Streep sure makes a great Margaret Thatcher.